The SD series is the ideal machine for small, medium and large sized farms and combines a compact, light design with the proven Kubota quality. Working widths in 3.0, 3.5 and 4.0m are available. 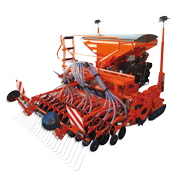 Due to the large hopper volume and electronic control of the seeder, set-up times and performance is increased .